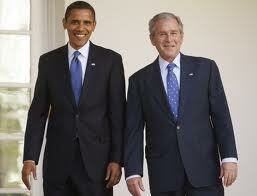 George W. Bush is a single individual, who will permanently leave the American political stage on January 20, 2009. But the political movement that transformed Bush into an icon — and which loyally supported, glorified, and sustained him — is not going anywhere. Bush is but a by-product and a perfect reflection of that movement, one which has been weakened and diminished by Bush’s staggering unpopularity but is far from dead. It intends to rejuvenate itself by finding a new leader, one who appears cosmetically different from the deeply unpopular Bush, but who, in reality, shares Bush’s fundamental beliefs about the world (which are the core beliefs of that movement) and who intends to follow the same disastrous course Bush has chosen for this country. While I think reading between the lines, Glenn is primarily indicating someone of the same “good versus evil” moral persuasion as Bush continuing on his legacy, and President Obama most certainly, regardless of your opinion on him, does not fit that, I think it’s possible to, nevertheless, look at that “cosmetically different” line and make it applicable to the Obama presidency thus far. Let’s get out the obvious. In a literal sense, President Obama is cosmetically different than President Bush – he’s the first black president. And that discussion is worth having in terms of the influence race has on the sociopolitical climate and so forth, but for my purposes, I’m not really interested in that angle. As such, let’s continue on. I most certainly believe that President Obama is cosmetically different than Bush beyond a literal sense or at least, it appears that way. 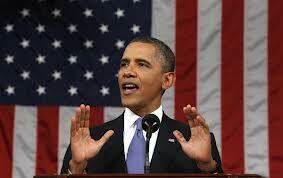 He’s more articulate, appears more educated, more pensive, more reserved, more empathetic and more charismatic. He is in direct opposition to the caricature of Bush that’s pretty close to the reality: that of a Southern redneck with a simplistic morality that is inept, incapable and inarticulate. Every bit of the nasty War on Terror apparatus started by Bush and his administration in the aftermath of 9/11 when they were given carte blanche by an eager-to-please Congress and a submissive media, from wiretapping to indefinite detention without due process to rendition to torture to war to the expenditures on that apparatus therein, Obama has continued or otherwise exacerbated. Additionally, he’s been far worse than Bush on the matter of warring with journalists with respect to prosecution of whistleblowers and the criminalization of investigative journalism such as that of James Rosen. Moreover, he took the worst of Bush’s policies with relation to our enemies – indefinitely detaining them without due process in Guantanamo Bay – and negated the whole “capture and detain” part by bombing them from remote drones in countries like Afghanistan, Pakistan, Yemen, Somalia and elsewhere. Even going further, beyond the difficult to determine civilian deaths, those drone strikes have resulted in the death of American citizens; a minor too, in the case of Anwar Al-awlaki’s son, Abdulrahman. And despite their best claims at transparency and openness, the Obama administration has been stringent in not revealing information about his death. Finally, I’d be remiss if I didn’t mention the undeclared and not authorized by Congress war with Libya, as it went beyond even the purview of the War Powers Act of 1973 and reflected President Obama’s view on his own executive power. Currently, to continue with this thought, we’ve been meddling in the affairs of Syria by arming questionable rebels. With the advent of this new information via Edward Snowden’s leaks about just how big the secrecy and spying apparatus is at the NSA, it was pretty surreal to see President Bush defending not only the program itself (PRISM), but President Obama. On other issues, he’s been pretty dismal as well. He continued Bush’s bailouts and the overall Keynesian rhetoric that this was “necessary to stave off economic calamity.” He’s maintained the atrociously bad War on Drugs, even taking a hardline against medical marijuana users. He’s made war apologists out of liberals (like Joe Klein of Time magazine) that once decried the abuses of the Bush administration. Perhaps, it is because he is their guy, as opposed to Bush. The anti-war movement is not anywhere near what it was at the height of the disapproval of Bush’s presidency. It’s beyond baffling. In sum, Obama has very much continued the “tragic legacy” of the Bush administration and the awful War on Terror apparatus and in some cases; he’s expanded upon the powers of the executive branch in ways unthinkable even in the Bush Era. Some will rightly point to the successes of the Obama administration, mostly in the realm of gay rights: undoubtedly, gay rights in many ways thanks to Obama’s shift on the position have progressed to a much laudable degree. Indeed, I give President Obama credit for that. Moreover, he did wind down the Iraq War greatly, even though it took longer than it should have, but still, it’s praiseworthy enough to file under “successes.” Although, as a friend pointed out to me, President Obama actually wanted to send more troops into Iraq beyond the Bush signed Status of Forces agreement in 2008, which effectively ended the Iraq War in 2011. More credit actually lies with President Bush for ending the war since he signed the agreement, but both presidents seemed to do so begrudgingly. However good Obama has been on gay marriage doesn’t negate the expansive executive power, the secrecy, and the moral wrongness. Just because Obama doesn’t purport to see the world as merely “good vs. evil” or act cavalier like Bush doesn’t mean he’s not acting cavalier like Bush. For one example, Obama administration officials leaked the “kill list” to the New York Times with detailed information about how Obama goes after “terrorists” and the ambiguous language used therein to classify them, among other transgressions, but with the intention of asserting his toughness on terrorism. There’s two further points to this example that boggle the mind. That in the current political climate, our priorities are so out of whack since 9/11, that a “kill list” and all that it entails is seen as a good thing; and that it’s acceptable for government officials to leak classified information and for entrenched media like the Times to report on that information, but if someone like Edward Snowden, among others, does so, he’s traitorous and deserves punishment, and the journalists, like those at The Guardian, including Glenn Greenwald, deserve condemnation and outright dismissal. One final point, Obama, the constitutional lawyer professor Nobel Peace prize-winning democratic president, as Jeremy Scahill is fond of saying, has put a well-articulated, well-meaning, and caring face on illegality and immorality once thought the bane of our American experience under Bush; not just something to be rejected in the face of Obama’s hopeful election, but to be shunned as a blotch on American society, an embarrassment to what we can and should be representing. That, I believe, is what Obama’s legacy will be: continuing the tragic legacy of George W. Bush, but with a superficial cosmetic facelift that makes it seem somehow easier to swallow. Such is a sad representation of our priorities indeed. I envision a day, hopefully soon, where a politician won’t be so entranced by political power and the wielding of it therein; that a politician will begin to do what is necessary and right to restore America’s image and ideals by rescinding the awfully vague and all-encompassing War on Terror policies; and more importantly perhaps, I envision a day where the media regresses on their entrenched coziness with authority figures and becomes the “watchdogs” they are meant to be; moreover, then, I further hope that the American people, woken from their apathy and/or blindness (to defending or deference to party or politician loyalty) will lead this charge into a more legal, a more open and a more moral American society of governance and democracy. ← When I take off my vulnerability armor and allow myself to be seen…..